eat, drink & be vegan: Earth's Own Non-Dairy Milk Giveaway! Earth's Own Non-Dairy Milk Giveaway! Earth's Own is a Canadian-based company with a line of non-dairy milks, including Ryza and Almond Fresh. Have you tried these milks? If not, here's your chance to try every flavor! :) Earth's Own is offering giveaway vouchers for two lucky readers! 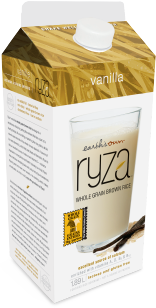 Ryza is a brown rice non-dairy milk, with a light texture and faintly sweet flavor. What's special about using brown rice is that since the rice grains are not milled or polished, all the vitamins and minerals of the whole grain are retained. Ryza has no added oil, is naturally low in fat, and is enriched with vitamins A, D, and B12. 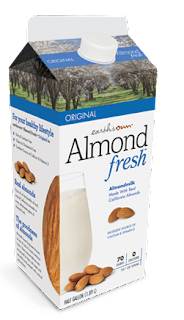 Almond Fresh is also enriched, and made from - you guessed it - almonds! Almond milks have become my favorite non-dairy milk in recent years, especially unsweetened varieties as they work well in a variety of recipes. But, once in a while you must break out the chocolate, and Almond Fresh also has that for you to try! Imagine making a delicious chai latte... or maybe a chocolate chai latte! Yeah, that's the prescription for a cool fall morning! AND, for the chance to win a really big prize, click through to enter Almond Fresh's Real Nutty contest - the grand prize is a trip for 2 to Napa Valley, plus the chance to be one of 40 winners to receive $50 worth of Almond Fresh product vouchers! Great giveaway. I've never tried their rice milk. I'm really encouraged that Earth's Own makes an almond milk without added sugar (the first one I've ever seen). Now, if they would cut the salt, I'd be a happy girl! FUNN!!!! I love this! I really enjoy both of those milks. Great giveaway! A chance to try a new product and enjoy an old favourite! What a great giveaway. I love their rice milk. We switched to Non-Dairy milk this year and I love it. I haven't tried this one before and I would like to. now that I've found out my son is allergic to only peanuts, almond milk is back on! I haven't tried Earth's Own before. I've recently started buying Earth's Own Original Almond Milk and love it in smoothies...what a great prize! I love the almond milk, and I'd love to try the rice milk. Thanks!! I just bought Almond milk because I read it isn't good to have too much soy, so it would be great to have the coupons so I can be healthy! Creamy almond milk in my oats every morning is a treat I look forward to every day! I'll have to find a store that carries this line! I'm an almond milk fanatic but haven't had the pleasure of trying brown rice milk yet! Yum! I've never tried brown rice milk but am an avid drinker of almond. Bring it on! Would love to try these non-dairy milks! Omg, I love this idea about making a chocolate chai latte! Good giveaway, I've tried the Almond milk, it's great! I would love to try these products, haven't seen them yet! Haven't tried this brand yet. Will check it out. Yum! I love trying new non-dairy milks! How exciting! I've never heard of either brand. ooo a chocolate chai latte? i need to try this out! I usually make my own non-dairy milk at home, but it's nice once in a while to take a break and simply enjoy a carton of store-bought milk. Seeing as I'm having a very busy few months ahead, I'd really appreciate those vouchers for Ryza and Almond Fresh milk! I only drink Almond milk, but it is so expensive, I don't drink it much! This is a great giveaway. I will have to try this almond milk! Thanks! Oh, I love almond milk would love to try either one of these! Just turned vegan (OK, two months), and still exploring milk alternatives. So want to try this! Great giveaway! I'd love to try this brand, especially the rice milk. I don't usually buy that. I've seen these in the store but haven't tried them yet! would love to try, especially the rice milK! I haven't seen those milks before--I'd love to try them! Haven't seen Earth's Own at my local stores yet. I'll be sure to look for them next time! Earth's Own is a division of the Australian company Sanitarium. Sanitarium is owned and operated by the 7th Day Adventist Church. OH MY..What a great opp to try something new. I've not strayed from my usual So-Good . The rice milk sounds good. So far, the only non-dairy milks I've tried are Soy and Almond. I'm looking to explore new flavors. I bought my first carton of Oat Milk ... haven't tried it yet though. Should be interesting! I would love to try this stuff. I keep seeing it at whole foods and wondering if it is any good. Thanks so much for a giveaway chance. I would love to try these. I often buy Earth's Own unsweetened almond milk, but I have been eyeing up the chocolate lately. Would love to win to try it out! Mmmm this would be lovely. Love their almond milk so! I just started eating vegan and I've never tried either of these! They look yummy! Chocolate chai lattes sound amazing... I have an espresso machine, maybe I should figure out how to work my steamer for some delicious lattes. Almond milk has become my favorite as well although I've never had this brand. I would love to try it out. These non-dairy milks sounds great! I'd love to try them! I love almond milk and have never tried brown rice milk before, but I love that it has B12 in it. Thank you for the generous giveaway! AWESOME! I am always looking for products that are a step above the rest . . . offering us better nutrition. I have not yet seen brown rice milk on the market. EUREKA. I can't wait to try this out. My daughter is an almond milk fan, (unsweetened) and we usually shy away from the normal rice milk because it is not all that nutritional.... my husband says he would rather drink water than rice milk (at least the ones on the market now). Thank you to Earth's Own! I will start looking for your products in my NoHo Hood! I have seen these in the store and have not yet tried them...I am curious now! I love almond milk! I haven't tried this brand before, though. I had their chocolate almond milk this past Sunday and it was very good. I'd quite look forward to trying more of it, haha, but also their other products too! I haven't tried their milk...is it any good?